Getting your business to the top of search engine results and in front of potential clients or customers should always be a priority when creating your website content. While some search engine optimization practices may seem completely overwhelming, there are actually some super simple (and super effective) ways to boost your SEO that you might be missing out on. Your site meta description is the blurb of content that shows up directly under your site title in search engine results. It’s important to optimize this description to increase how your site ranks for your relevant keywords. Keywords are king when it comes to your SEO. 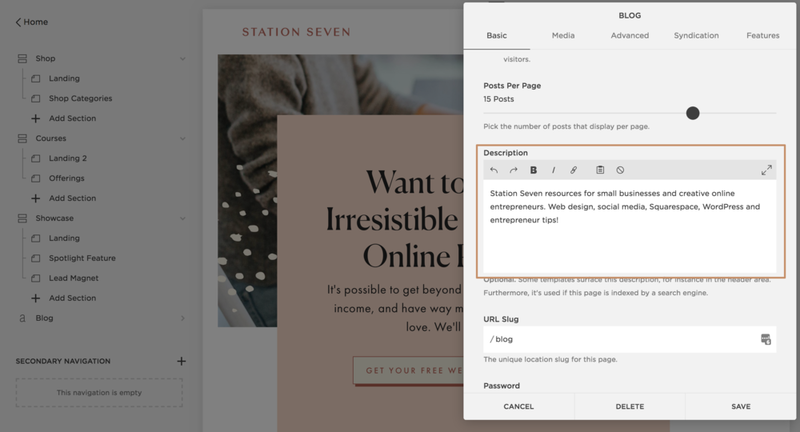 Creating a powerful, keyword-rich description for any portion of your website does take a little bit of finesse, but we have some easy ideas to help you get it just right. You want your descriptions to be definitive, keyword-rich and sound as natural as possible. A helpful tip is to read your description aloud to check that your copy makes sense and sounds organic - not too stuffy or robotic. To customize your site’s meta description in Squarespace, visit your Marketing menu, select SEO and from there, update your Site Meta Description. Quick note: Meta descriptions have a maximum limit of approximate 160 characters before being shortened, but we recommend aiming for even less, around 120, as different browsers and devices (like mobile) will show even less. Just like your site’s meta description, you can also create custom meta descriptions for every page on your Squarespace website. Page descriptions add to your overall searchability and provide more opportunity to get your business in front of the right people. Think of your ideal client when you write this. Try to imagine the types of things that they will be searching online for their business. Again, don’t forget the character limit! To customize your page meta descriptions, go to the Pages menu and click settings cog next to the page you want to edit. Then, enter your meta description in the Description box. Instead of having to manually customize the title of every single page on your website, Squarespace can automatically add your keywords to each and every title to improve your keyword visibility in search—these are called title formats. To access this setting, visit the Marketing tab in the main menu of your Squarespace site, then select SEO and scroll to the bottom to Advanced. You can update your Homepage Title Format, Page Title Format and Collection Item Title Format through this window. This allows you to control how most titles appear in browser tabs and search engine results. Don’t forget about the variables that also factor into your title link format. See the screenshot below for details! This content will show up in browser tabs and search engine results, and is an easy way of prioritizing the keywords that you want your site to rank for. Quick note: Title formats have a limit of approximately 50-60 characters. Make sure not to exceed this range! Search engines rank your site based on the content they can view when crawling your site. However unlike your visitors from Pinterest, search engines can’t “read” pictures! In order to overcome this limitation, use image alt tags to provide keyword-rich context to your images. 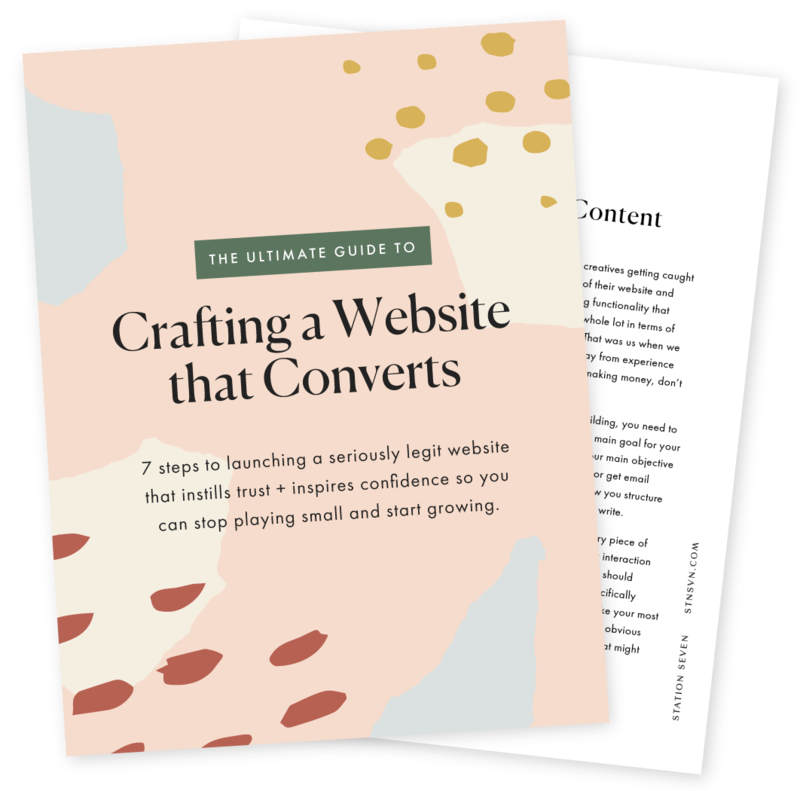 You can complete this step one of two ways for your Squarespace site. The first way could be through your naming convention for the images you upload to Squarespace. For example, saving an image as “screenshot.983.png” isn’t ideal. “SEO-Tip-Squarespace.png” is more like it. Consider that when uploading images to your site. Another way is through customizing the alt tag through Squarespace. If you are going through old posts or you happen to forget to save your image with an SEO optimized name, you can update this directly through Squarespace. We’ve got a whole post on why alt tags are important, plus step-by-step instructions on updating yours in this blog post here. These easy to follow steps can change the game for you when it comes to improving the SEO of your Squarespace site. Get your business top of mind and top of the search results! Have any other great SEO tips for Squarespace? Be sure to let us know in the comments below!